Saturday Night Live relives Empire actor, Jussie Smollett's recent controversy with some hilariousness. SNL showcased a point of being an equal opportunity offender in its first episode following the show’s two-week break. The return opened up with a cold address towards the latest Donald Trump news–specifically the long-anticipated release of Robert Mueller’s report–and featured the reappearance of Robert De Niro in the show for the fifth, and likely final, time as Mueller. But the night’s hilarious yet surprising moment turned out to be the savage act of Empire star Jussie Smollett, who was recently in the news this week after Chicago prosecutors had dropped all charges against him for allegedly faking his own attack. Empire actor, Jussie Smollett's controversial case teased up in SNL. In the beginning, SNL’s Smollet is unable to convince the rest of the guys, so he reaches into his plastic bag to reveal the evidence, and hints that it carries the possible clue for identifying Smollet’s attackers. “I think it’s a bag of clues,” Tedd suggests, pulling out a box of Crest Whitestrips, three oversized red K’s to spell out KKK and the purple member of the Teletubbies, the latter which Tedd claims as a “gay one.” McKinnon then recommends calling the authority, which Tedd’s Smollet straightly denies. 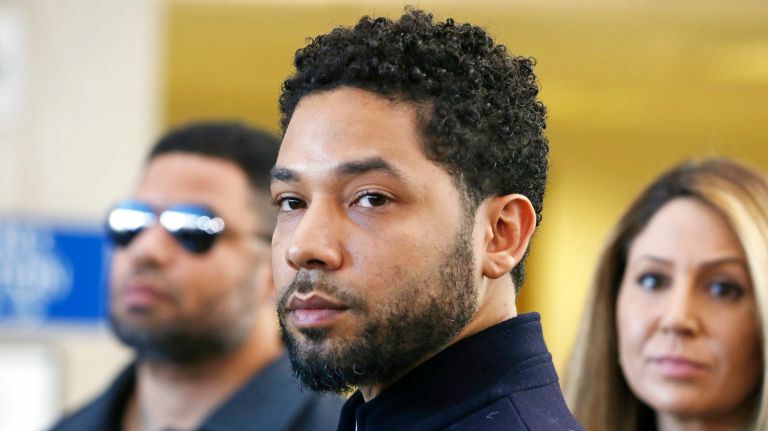 “They said I could never call again as part of the deal,” Smollett explains–a reference to a classified agreement that led to Tedd’s charges being dropped. Over at the Empire, Smollett’s character, Jamal Lyon, has been removed from the final episodes of Empire‘s current season. As of now, no decision has been announced regarding the actor’s return whereas Tedd has continued to insist that he’s been truthful and honest throughout the case. But in the world of SNL, Smollett is already in his way to retirement from Empire. “You know we gotta fire you, right?” says Daniels (as played by Thompson). He loses his agent, Oh as well. “I just hope he gets the help he needs,” says the Oh’s SNL character. The drama then ends with Smollett re-entering the room, this time wearing a neck brace and dark sunglasses, and complaining about yet another attack. In this particular SNL burlesque, the audience wasn’t entirely certain how to respond to “Network Meeting.” Most of the one-liners were met with rather a nervous giggle than some usual big laughs, especially on the account of explicit comment, “Smollett’s state of mind.” The parody wasn’t received well by social media either.